The Community Foundation of Muncie and Delaware County, Inc. has announced that Jeannine Harrold has been awarded the 2018 David Sursa Leadership Award to recognize her dedicated service to Shafer Leadership Academy. 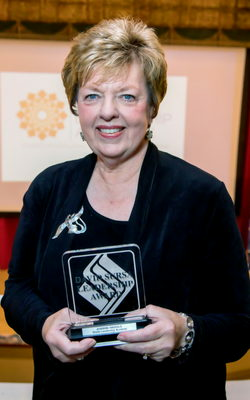 Harrold was nominated by Shafer Leadership Academy, where she served as a founding board member when the organization incorporated as LEAD-ECI in 2007 and continued her service until 2017. During her ten years of service to the organization, Harrold served as board president, program committee chair, executive director search committee chair, and board recruitment and development team chair. Harrold was selected for the David Sursa Leadership Award, because like Mr. Sursa, she was blazing a new trail with her dedication to Shafer Leadership Academy. This was illustrated by her visionary guidance to the organization. Her leadership not only provided Shafer Leadership Academy with a strong start and present-day success, but it also laid a foundation for a bright future. Additionally, Harrold’s commitment and dedication wasn’t isolated to Shafer Leadership Academy, but instead impacted numerous organizations and the community at large. In her nearly 45 years of community service, Harrold has also served as the board president of YWCA of Muncie and the Altrusa Club of Muncie. She has served on the board of directors of High Street United Methodist Church and Riley-Jones Club for Women. She co-founded the Ball State University Foundation Discovery group and Muncie Young Professionals. Across the community, she has served as a consultant for youth programs, assisted with fundraising efforts, and the list goes on. Harrold was surprised with the award during the Shafer Leadership Academy Annual Meeting on June 19, 2018. Additionally, in David Sursa’s honor and to commemorate the award, The Community Foundation of Muncie and Delaware County awarded a $1,000 grant to Shafer Leadership Academy. For more information about the David Sursa Leadership Award, please visit The Community Foundation’s website at cfmdin.org or contact Kallie Sulanke, Community Engagement Officer at ksulanke@cfmdin.org.